I would like to thank my alarm clock for going off at 8:30 this morning. It allowed me to catch about half of the interview with John Baird, the new Environment Minister. Instead of making any bold initiatives about climate change, he spouted out the same old anti-Liberal rhetoric from his provincial politics days. When asked about any big spending, he refused to even mention of Jim Flaherty would consider giving him money. This smacked of the same old Conservative spin, of blaming Liberals for all the problems and not having any dramatic initiatives of their own. One thing that did actually surprise me is that Baird acutally admitted that climate change is a reality, and that even he noticed it this year. He proceeded to wander into the provincial debate on goal, and blaming the Ont Libs for not doing their part. But, I wonder if Stephen is pulling his glued in place hair out for going off the neo-con denial of climate change. But, there is a positive in this, its more of the same old spin, no good ideas, just blame and hearsay. I like the sounds of that, the Cons' have no good plans for the environment, which is the biggest issue in the country right now. Lets hope it stays that way. 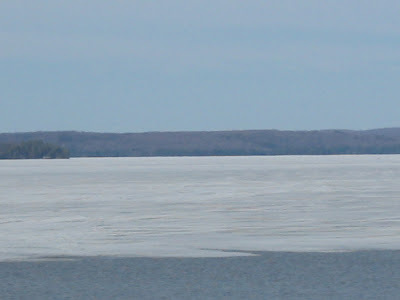 That is a pic from my cottage last April, of the ice receeding, I doubt we will have any ice this year at the current rate of temperature change. Posted by Jamie Callingham at 6:25 p.m.